This tutorial will guide you on how to connect end-point devices routed by the ITG200 LoRa Gateway from Khomp. Firstly, you need to configure your ITG200 Gateway using the Khomp configuration server. Click on this link to access the Khomp remote server and the most recent documentation (you will need to sign up first). Follow the steps that will prepare your ITG200 to communicate directly with TagoIO. Secondly, you will need to add the End-point devices in your account at TagoIO. 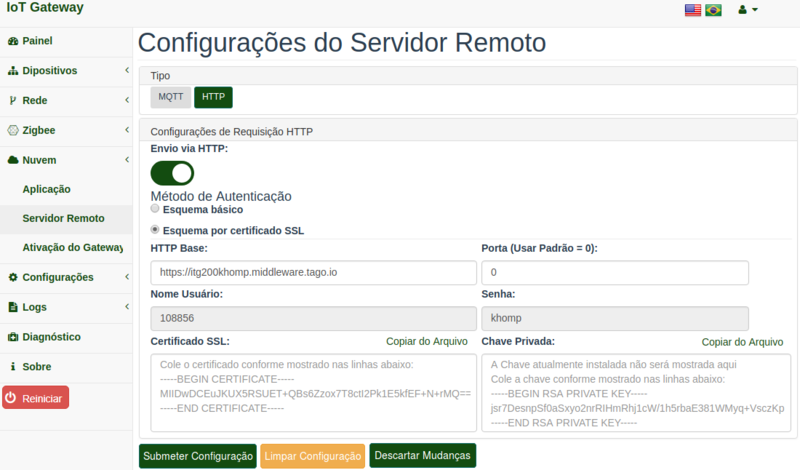 Notice that you only add the end-point devices to your TagoIO account, not to the gateway. To add an end-point, go to the Devices section, click on New Device and search for Khomp or ITG. If you use a Filter, select 'LoRa' or 'Zigbee' protocols. When you complete the setup above, the TagoIO system will have created a Device, a Bucket that is linked to your Device, and a Dashboard to view your data. Now turn your end-point device on, and wait for the data to hit its data bucket! Every time the device sends data, the parser will be executed, and all data will be ready to be shown in the dashboard. Notice that a script was added in the 'Payload Parser' tab. This parser can be used to manipulate the data sent by the device. This script converts the temperature unit from K to C. Feel free to edit it as needed. You can edit the dashboard created in your account. Then, you can create notifications (Push Notification, e-mail, or SMS) and build advanced scripts as needed. Enjoy your Khomp devices with TagoIO!